At the heart of many Nepalese festivals are ritual dances: without the performance of those dances there is no festival. Historically dances in Nepal as well as festivals themselves were patronized by kings. Only the king could decide to introduce a new dance-drama or a new festival. 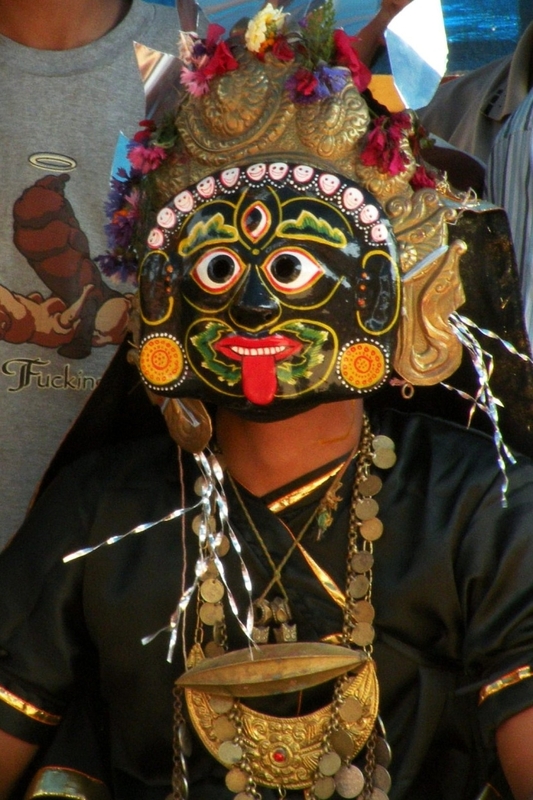 Special masks are worn during such ritual dances. These masks are made of perishable materials such as papier mache, wood plastered with clay and linen, and are painted in lively colours. The masked dances tell intricate stories about the gods as well as great heroes. I am not a Buddhist but when I get tired of busyness and noise of Kathmandu I like to go to one of Buddhist sites, for a dose of peace and tranquility. And Namobuddha is one of my favourite such places. It is an hour drive from the capital and is quite a popular pilgrimage spot. According to the legend Buddha, in one of his previous incarnations, sacrificed his body in order to feed a starving tigress and her cubs and it happened just there, at Namobuddha. It can happen with you only in Nepal I believe: you drive the winding road zigzagging among the green hills. The views are spectacular, the air is refreshing and cool. Then one more turn and bum! they are there, the snowy peaks of the Himalayan range. Where were they hiding just a moment ago? You knew they were somewhere out there and still, when you see them before your eyes, you are stunned. By the suddenness of it, by their closeness, by their beauty, by their grandeur. That's what happened with me on the way to Kakani. This place is known as one of the best viewing points to see the Himalayas. But as it turns out the peaks come into perfect view even before you reach your destination. Last Saturday I had dinner at a new for me place, Alice restaurant. It looked rather cozy, with a mini-pond at the entrance, large children play area and comfortable cushioned sofas. They had quite an impressive menu featuring Nepali, Chinese, Japanese and Continental dishes some of which you would hardly find anywhere else in Kathmandu like cabbage, green and buckwheat momo, bacon wrapped grilled prawns or squid in chilly oyster sauce. We ordered mixed Nepali/Chinese snacks and Continental main courses. I really enjoyed all the Asian snacks but was quite disappointed with the main courses: Lamb Casserole in Spicy Red Wine and Chicken a-la Orange Mustard. The lamb was rather chewy and the orange sauce was too much acidic. There was one more negative point that I need to mention: in spite of the ban on smoking in public places there were people freely smoking at the restaurant and I didn't like it. These guys were performing during Planet Nepal event. I liked the music they played and I liked their uniform. The sound of those bagpipes is amazing. 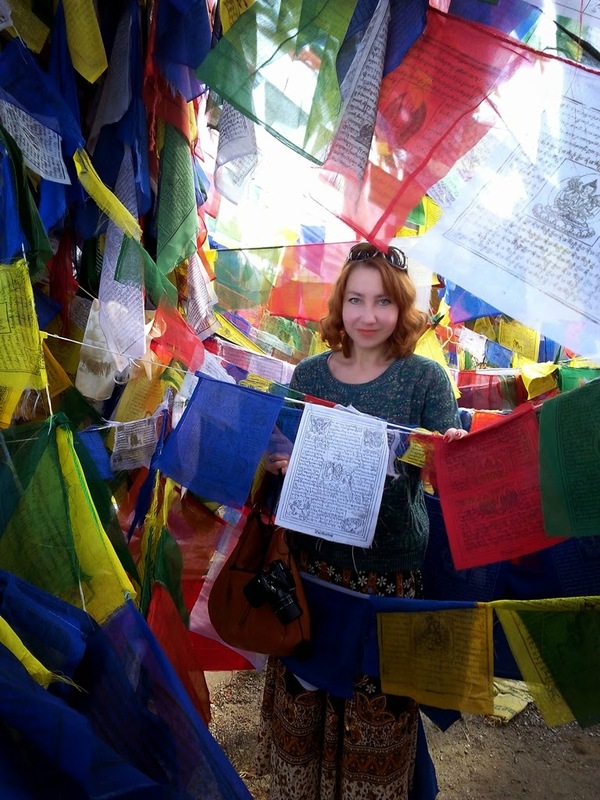 I am a Belorussian who lives in Nepal and travels occasionally. Namaste means Hello in Hindi and Nepali. This blog is a visual record of anything that I find worthy to record be it places, people, events or things.